So, I got an Air Brush for Christmas. On Christmas Day, it came out of the Box. On Christmas Day, it went back into the box, where it has stayed, in varying locations around the house, intimidating me, ever since. But. No more. Me and the Air Brush are friends, having spent a happy afternoon spraying things blue. And when I say things, I mean things. As in, all things. The piece of card I wanted blue. The scrap paper under the piece of card I wanted blue. The computer, next to the scrap paper, under the card I wanted blue. My hand, over the piece of card I wanted blue. You get the gist. That's a great tag Faye and sounds like you've had a fun day! Love all the inky stuff and seen loads of Frantage'd stuff around blogworld but not got any yet. It's gone on me list! Oh my - yet another song to stay in my head. It sounds like you had loads of fun. Your tag is gorgeous. I love the image, perfect colouring and the background looks wonderful. Great tag Faye! The image is cute! Looks like fun to color! I made a card today it isn't posted yet but I tried my hand at doodling! I need a light box! So I can take a pic when there is no natural light! Fantastic about getting the new air brush system!!! Know you're going to have fun with that. Love your tag! WOW!!! So very pretty and the coloring is just fabulous as always. Your fab use of the airbrush really turned out well tho... I love how it looks.. and am sure you'll be getting plenty more use out of it! Sounds like you have been having fun Faye, it's absolutely fabulous. A gorgeous tag Faye, and its sound like you really enjoyed this. Love the tag!!! That background is FAB!!!! 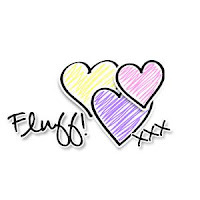 Such a beautiful tag Faye!! And yes, I bet that song will pop into my head later today at an unexpected moment! Fabulous tag, just perfect image for Craft-Room Aquarius Challenge. What a great tag! 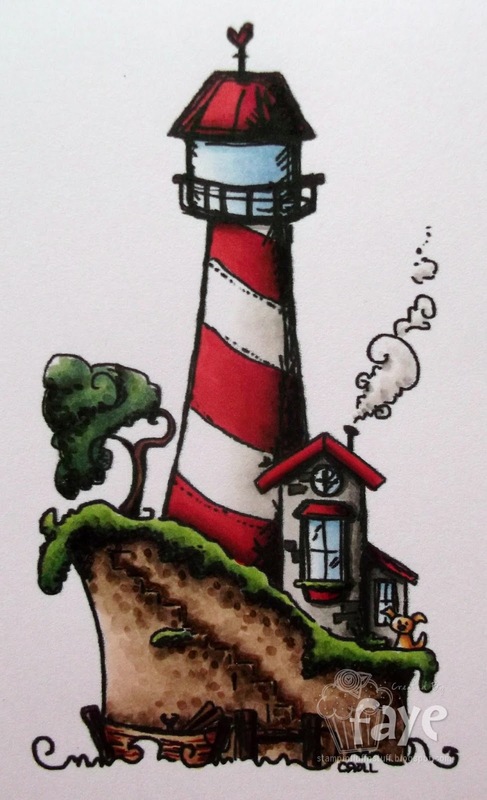 The lighthouse makes me think of summer days at the seaside - a very cheerful thought on a filthy day like today!! I love nautical themed projects and I love every little detail of this tag! Image: fantastic design and wonderful coloring. Background: a real Wow factor with the blue nuances and the sparkle from the frantage. Love the piece of cheesecloth too! You had a messy desk!! Bet that lasted all of 5 mins. Hugs muver. Just fab!!!! Love it and can't wait to see more and more of your wonderful work. 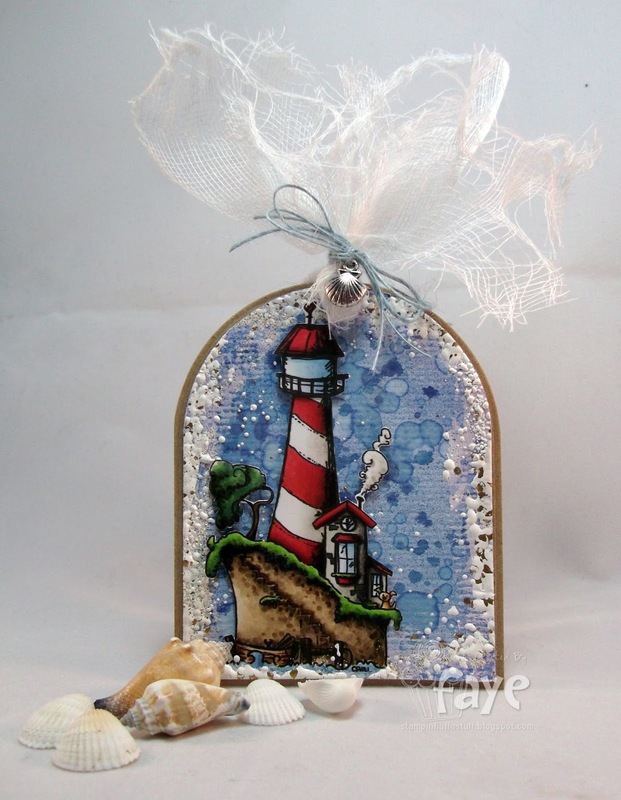 A fabulous tag, I love the image, thank you for sharing it with us at Craft-Room challenge.